2018 Larson 2020 FX DC SAVE BIG ON THIS NEW 2018 LARSON FX 2020 DC! 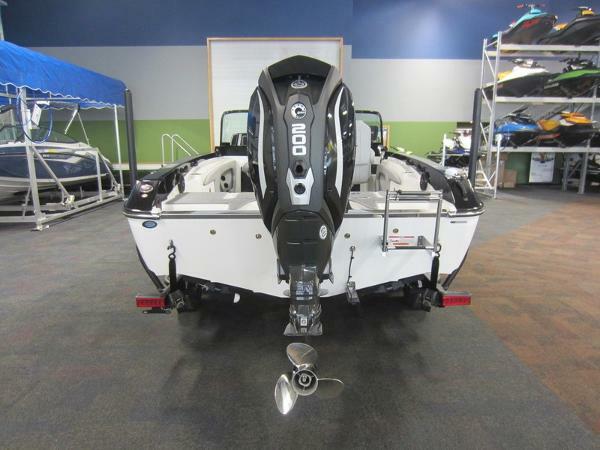 A 200 hp Evinrude G2 E-TEC direct-injected outboard with Dynamic Power Steering and a 5-year factory warranty powers this nicely equipped fiberglass fishing package. 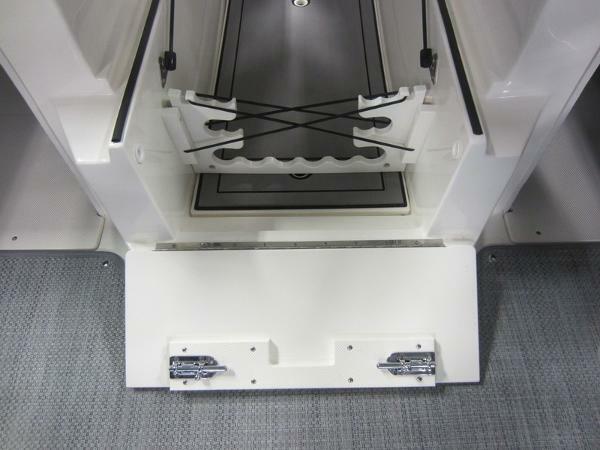 Optional equipment includes: MinnKota Terrova iPilot 24-volt 80 lb thrust trolling motor w/battery condition gauge and removable bracket, iPilot remote control, Humminbird Helix 9 GPS fish/depth finder w/weather guard, Pro-Mariner 2-bank on-board battery charger, Rockford Fosgate AM/FM bluetooth stereo w/AUX and USB, snap-in Seagrass flooring, tackle tray holder, stern recirculator/oxygenator livewell, trailer load guides, and matching spare tire w/mount. 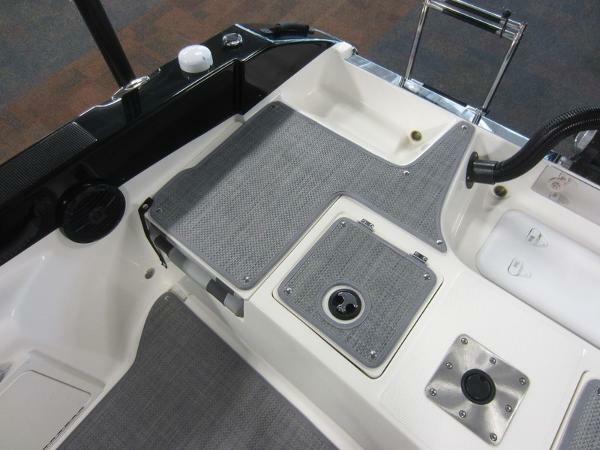 Standard Features include: Larson 5-to-Life hull warranty, non-slip fiberglass floor, dual consoles w/full walk-thru windshield and under console storage, lockable passenger console glove box, 4.3” Evinrude Icon digital screen w/weather guard and gauges including; tachometer, speedometer, trim, engine temperature, fuel economy, battery voltage, and trip distance; 12-volt power outlet, bilge pump, lighted helm switches, navigation/anchor lights, courtesy lights, electric horn, tilt steering, raised bow fishing deck including; bow panel w/trolling motor plug and trim switch, port side aerated livewell w/timer and light, storage compartments, starboard side tackle tray storage, port and starboard side cargo nets, Rod Buckle rod tiedowns, center rod storage box w/rod tubes and trolling motor battery storage; port side cockpit rod storage cubby, starboard side storage cubby w/cargo net, port and starboard side fold-down storage compartments, driver’s reclining swivel bucket chair w/slider and flip-up bolster, (2) swivel fishing chairs w/5 floor bases, raised stern fishing platform w/(2) flip-up jump seats and battery under storage, stern aerated livewell w/timer and light, on/off battery switch, 3-step telescoping boarding ladder, (6) pop-up mooring cleats, stainless rub-rail insert, 53-gallon fuel capacity, marine cranking battery, (2) deep cycle trolling motor batteries, fire extinguisher, passenger safety handles, and 7-person carrying capacity. Also included is a Shorelandr tandem axle bunk trailer including; surge brakes, swing tongue, 14” aluminum wheels, LED lights, diamond plate fender steps, ratchet tie-down straps, side centering poles, swivel jack, and bearing buddies. Trades will be considered and delivery is available. Competitive financing rates and terms are also available. Approximate payment is $483/mo. for 144 mo. with 20% down (WAC). Leaders RPM is one of the largest marine and powersports dealers in the Midwest with over 70,000 sq ft of showroom, parts, and service under one roof located in Kalamazoo, MI. Price is plus freight, prep, sales tax/fees and is subject to change without notice.